Most nonprofits rely on the strength of their volunteer program to succeed, and SAFE is no exception. We’ve been building a volunteer program for the past 10 years, and it’s something we’re super proud of. But the work never stops, and there’s never a lack of things to do around the farm or in the office, so it’s not often we can slow down and take a look at what we’ve got. Fortunately, we keep very good records!! So…in 2018, we had a LOT of active volunteers working for SAFE. The majority put their time in at the farm, tending to the never‐ending needs of our horses. Others work on the equally never‐ending list of maintenance projects and property upgrades. 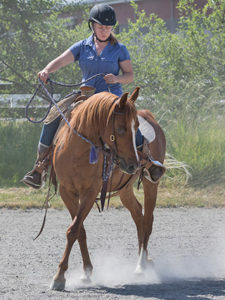 Still others are working behind the scenes making the organization tick: dealing with adoptions and intakes, training, foster homes, vet care, and the many other tasks that a horse rescue requires. Then there are the volunteers who work on events and open houses, who work to promote SAFE and raise the money needed to keep the lights on. And let’s not forget the people who govern the organization, setting the stage for SAFE to grow and improve as an organization. Can you guess how many people it takes to run an organization like SAFE? In 2018, there were about 250 volunteers who put in time for SAFE. That is a LOT of people! And astonishingly, we still feel like we’re never quite caught up. There always seems to be more to do! Last year, there were 146 people who filled out an application to become a volunteer here at SAFE. About 100 of those people came out to the farm and attended an orientation. And 75 of those people became chore volunteers, at least for a while. Not everyone who shows an interest in volunteering ends up deciding that cleaning stalls in the cold/the rain/the heat is for them, and that’s okay, but that’s still a lot of people who were scheduled onto a shift and received training. By the end of the year, there were 57 new volunteers who made the team and are still volunteering here. The SAFE Volunteer Program is meant to be more than just a way to get the work done. It’s meant to be a community, where people who share a passion for horses can work together to make a difference. 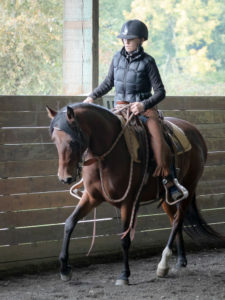 There are people who come to SAFE to volunteer who have no horse experience whatsoever, just a desire to learn. The horses themselves are great teachers, but we are continually working on ways to provide further education to those who want it. There’s our three part Level Up program, where volunteers can become “SAFE‐Certified” in horse care, basic vet care, and horsemanship. There’s our developing “SAFE University,” an in house video series designed to demonstrate the SAFE way of doing things. Volunteers work side by side with our Barn Managers, Lori and Lexee, who are always happy to help volunteers learn new skills or improve on old ones. 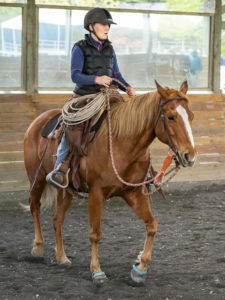 And volunteers are welcomed and encouraged to audit horsemanship clinics at the farm, for no fee, to learn more about the training methods we employ to teach our horses. Her heart. She feels so deeply and cares so much. Her unabashed willingness to share. On any day, it could be her time and energy or her home or car or a meal but most of all she shares her passion for SAFE. Her love and compassion for everyone and every animal she meets. Her sweet and sassy personality. Her vibe. Every time I see her I get the biggest smile and have to immediately go give her a hug. Everything! She’s always in an upbeat positive mood and always says “thank you for being here” every time she walks through the barn. To each and every volunteer, all the way down the barn. Not just me. It’s very sweet! The way she combines her business like demeanor with a playful passion for life! She always has a smile and a hug for everyone, no matter how bad SHE is feeling. She hugs me with her whole heart. Her passion and deep caring for animals, and helping wherever/however she can. The way her blue eyes sparkle, her sincere desire to make people happy, the way her emotions are displayed so readily on her face.… she just makes me grin! She throws her whole heart into the things she is passionate about. How lucky is SAFE, to have a volunteer who inspires such feelings in the people she works with? The answer is VERY lucky. So from the bottom of our collective heart, thank you, Jane! Can’t wait to see what 2019 holds for us! Jane would be the first to point out that the SAFE Volunteer Program is special because of a lot of people, not just her. So a sincere thank you to Cathy, Blair, Kit, Heather, Jeanne, Caren, Lori, and Lexee for all that you did to make 2018 such a success. And last but far from least, thank you to the 250 volunteers who put their time in over the course of the year. Your kindness is changing lives! Interesting in joining the SAFE volunteer community? Your journey starts with a single click!